“Being apart of a community is what makes you happy…not rising to the top and sequestering yourself from community.” This quote is from one of my favorite podcasts, “Tangentially Speaking” with Dr. Christopher Ryan. During this show, he conducted an interview with travel host and producer, Jonathan Legg of ‘The Road Less Traveled’ who is the author of the quote above. I was listening to the podcast while I was driving through my hometown when the subject of ‘community’ came to the forefront of their interview. The two of them, who are both very intelligent and worldly men, explained to the listeners how chasing money, fame, and fortune doesn’t ultimately make us happy as human beings. I absolutely agree with this assessment made on the podcast and believe that while possessions, money, and owning property can create happiness in the short-term, long-term happiness and fulfillment can only come from strong bonds with your friends, family, and community. Dr. Ryan and Mr. Legg also mentioned in one segment of the podcast how isolating oneself while traveling, and staying in hotels does not create a great life experience. I couldn’t agree more having stayed in nice hotels, hostels, and guesthouses during my own travels. While one could be very comfortable and relaxed in a hotel, you won’t meet other travelers and potential friends as easily compared to when you’re staying in a cheaper hostel that’s in the city center. Dr. Ryan and Mr. Legg concluded in their discussion on communal living that the best way to live is to have your own space to eat and sleep, but to live in close enough proximity to others nearby that you can still have a sense of community and sharing without being isolated. I believe that compared to recent generations and even further back, the idea of community is starting to weaken and become less important which is in direct contrast to human nature and true happiness. Harvard Political Scientist and Professor, Robert D. Putnam, was one of the first people to bring to national attention the change and decline in communities with his book, “Bowling Alone: The Collapse and Revival of American Community.” He makes the argument that people have been interacting with each other less and less over the past few decades. Instead of going out to socialize in public through bowling leagues, picnics, sport clubs, religious organizations, etc., more and more people are opting out and have been expanding the amount of time spent using technology as a substitute. With the ability to have groceries, electronics, books, restaurant food, etc. delivered right to one’s doorstep in major cities and towns now, people have less and less motivation to leave the house. Telecommuting and ‘working from home’ have become more popular as well making ‘office work’ and ‘happy hours’ less obligatory. Social and traditional forms of media have exploded in the sheer amount of offerings whether its’ through websites, TV channels, and/or digital gadgets. When it comes to community life, religious and social organizations have often formed the backbone and glue that holds people together. However, many different news media outlets have reported that attendance at churches and synagogues have been taking a downward spiral. A growing percentage of Americans are identifying themselves as ‘atheist’ or ‘agnostic’ when it comes to their religious beliefs. Personally, I have no problem with our generation being an irreligious one but I do think it’s tough to replicate that type of community within other types of social organizations. In addition to the close bonds between neighbors that shared religious beliefs can bring, it can provide a sense of belonging just like many other social groups. Beyond religious affiliated groups, membership in long-standing organizations such as the Boy Scouts and other volunteer organizations is also on the decline as well. Recently, one of the pillars of my community that I was born into and grew up with shuttered its’ doors last year. My local synagogue where I was Bar Mitzvah’d, went to Shabbat services, and celebrated the Jewish holidays was not able to fund itself due to overall lack of membership and decided to merge with another still functional congregation. This was disappointing for me to hear about because I have a lot of fond memories of that place and the people I met there. It was more than just about religion but it was also a gathering place for Jewish residents of the local area to come together and get to know one each other better and form bonds of friendship. While members of the former synagogue have moved on to another synagogue nearby, it’s not the same as it once was and it’s difficult to integrate oneself into a new community. This is a trend that seems to be replicating itself across the country. Most Americans don’t know their neighbor next door like they used to and beyond the local school PTA of the local town or city, there’s not much anymore to bring people together. The increasing atomization and isolation of people is worrying for me to hear about. However, I am quite positive about the power and spread of the internet to bring people from different backgrounds and beliefs all over the world together. While it’s not perfect, you can still remain connected to old friends, former classmates, past roommates, etc. through social networking. Instead of bowling leagues, sports clubs, the local YMCA, now we have Meetup.com and Groupspaces. As technology continues to advance, the meaning of ‘community’ will continue to change and adapt to the times. However, we as human beings must not forget the importance of being apart of a community and how much it means to our mental health and overall happiness. 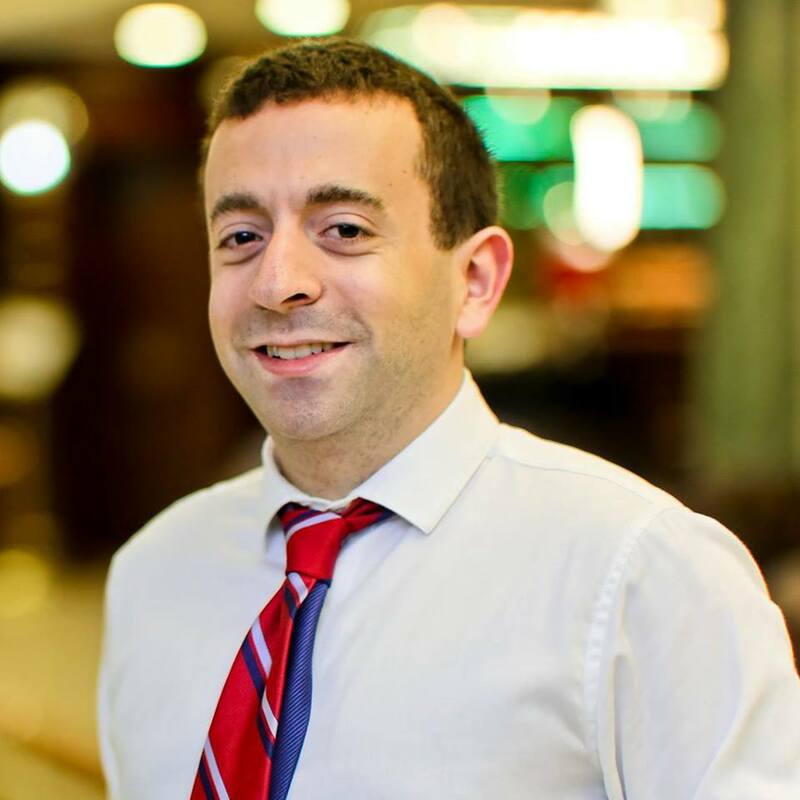 A story that has captured the headlines of most major media outlets recently is New York City restaurateur, Danny Meyer’s decision to end the practice of tipping in his many well-known dining establishments in the city. Unsurprisingly, this caused a bit of an uproar as some people praised him for this decision while others fumed about how this would cause poorer service and lead to higher food prices when dining out at a restaurant. This small decision could eventually gain momentum and cause dining establishments around the country to end an outdated cultural practice here that has been prevalent since the early 1900’s but has been absent in most European countries, Japan, China, and elsewhere. Both viewpoints hold valid concerns, however, I believe that the overall culture of tipping while helpful to servers, waiters, bartenders, hairdressers in helping them to make a living now is not the best that our society can do for them in the long run. When the minimum wage for tipped workers federally is still an extremely $2.13 per hour, and you have to fight and scrap for tips to make up the difference to crack the $7.25 per hour minimum wage that is in place for non-tipped workers, I believe we have a problem. More and more U.S. states have taken it upon themselves to raise the minimum wage for both tipped and non-tipped workers, and I applaud those actions. However, eliminating the ‘tipped worker’ minimum wage standard along with the raising the federal wage for both tipped and non-tipped workers to between $15-$20 an hour would be the right and just thing to do. Tipped workers should be able to earn a guaranteed hourly wage that is fair and livable just like every other hard worker in the United States. Yes, with tipping involved, a server and a bartender could make more than $20 an hour especially if they provide great service but that’s not always the case and I can imagine that they could come up short of what they were expecting to make during some hours of their daily shift. If I were a worker in the service industry, I would rather be paid a $15 or higher wage per hour than have to fight for tips each and every workday. Distribution of tips is not always equal in that not every worker from the dishwasher to the bus boy gets compensated fairly in terms of payment. Cooks and other workers at the back end of the restaurant have to compete with the servers for their tips, which could create an uneasy, and hostile work environment. Also, there are racial and gender biases that come into play as well when it comes to tipping workers that has been a problem in the past and still today. The argument that by getting rid of tipping, the waiters, bartenders, hairdressers, etc. would then provide mediocre or worse service to their customers is a faulty one. If tipped workers suddenly found themselves making a $15 or $20 minimum wage and had a chance to advance in their business or industry through other incentives like vacation time, health care coverage, sick days off, etc. then they would feel better about their jobs. They would want to provide good service because how much better their employers would be treating them due to the changes in laws and regulations. I have traveled to countries in Europe and the Middle East where there is little to no tipping culture yet the service is still fine. The servers there may not have asked me how my meal was but I got used to it after a while and appreciated that they would let me eat and talk in peace. If I needed something from them, I would just call them over politely as well. I also left them an extra 10% on top of the cost of my meal despite the tip not being mandatory to show my appreciation for their hard work. Lastly, when the time the bill comes, it’s often a struggle to figure about how much of a percentage out of the total to give the waiter/waitress, whether or not the service charge is already included or not, what is the amount of tax added on to the food, and/or alcohol that was ordered. To me, it’s always been a giant headache to pay the bill at the end of the meal, especially in larger groups. It’s because you end up doing the calculations on your own and you never know how much you’ll be paying in total until the end. I would prefer to have the extra costs of the service and taxes be added onto the costs of the food. This is what type of system that Danny Meyer and others will be implementing in their business. If this change gets implemented on a wide scale, every customer will know exactly what is to be paid at the end of the meal. By the time you sit down and look at the menu, you will know how much everything will cost and how much money you’ll be throwing down to pay without worrying about the added tip and tax. One of my favorite words in the English language recently is the one I just listed above along with the definition. Perseverance. 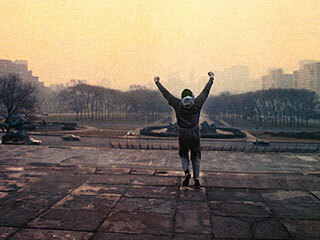 The innate will to finish what you started, and to become successful despite all of the obstacles thrown at you. Life can be pretty difficult to deal with sometimes and it’s hard to remain committed to your goals, hopes, and dreams. 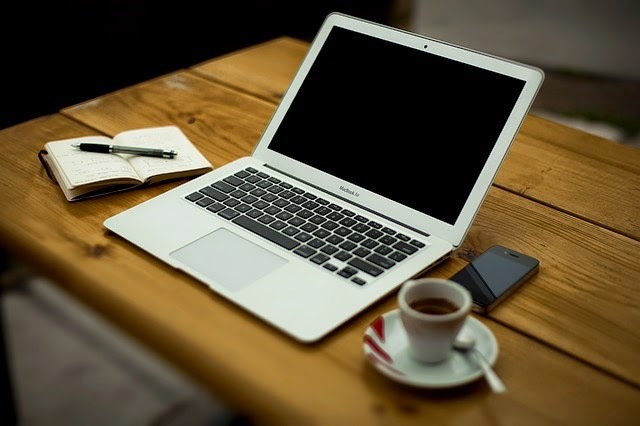 I’m writing you to tell you, dear reader, that despite the long odds, and struggles that you may encounter in your life, you have to push on each and every day to make it one step closer to becoming successful and making those dreams come true. It won’t happen overnight and there will be setbacks and false starts, but your will and determination will set you apart from others in getting to where you want to be in life. Remember, Each day, each month, and each year: you have to make small deposits in the game of life. Progress takes time and don’t be discouraged if you don’t achieve your success overnight. Remaining true to yourself and your vision of the future is important. Make sure that you surround yourself with those people (friends or family) who are supportive of you and your goals. Do not let yourself be dragged down by others who would wish you ill or divert you away from your path. Even if you fail and suffer at first, never ever give up. I happen to believe that everyone’s luck changes and that if you keep pushing forward and you work hard at anything in life, success will become a reality. Steve Jobs, Bill Gates, Michael Jordan, Abraham Lincoln, etc. are a few of the countless examples of famous individuals who struggled and failed in life at first but were able to persevere and overcome obstacles to become great and successful. One’s willpower and determination goes a long way in seeing who will make it in life and those who will just skate by in mediocrity. Your teachers, mentors, friends, and family will be there for you and will help guide you to future success but it is up to you, and you alone to make something of yourself. Each day you should ask yourself: How can I make myself better?, What do I want to achieve?, How can I be a better person?, etc. Even if you fail multiple times, use it as motivation to do better and better each time. Do not throw in the towel. Life is short and we do not have unlimited time on planet Earth. Make the most out of the opportunities given to you, and if none have been given or handed to you, take them and run with it. Only after blood, sweat, and tears will any of us achieve to what we set out to do. That’s the way it always has been and will be in the future. The road to success has always been paved with hardships and setbacks but that does not mean that we should give up or stop trying. To persevere is to set yourself apart from the rest, and I hope that each and every one of you reading this blog will keep that in mind. Edward Kennedy Ellington is rightly considered to be one of the leading figures and original titans of Jazz music. In addition to writing over 1,500 compositions, he was one of the most successful bandleaders and pianists of his time. To this day, he has stood the test of time and is one of the most influential musicians of the 20th century as well. Along with being a major figure in Jazz, Ellington’s music also delved into other musical genres such as blues, gospel, classical music and popular film scores. His career was one of the longest of all the Jazz legends, spanning about 50 years from the 1920s to the 1970s. He was a versatile musician and was extremely dedicated to this work. In addition to running his big band and orchestra, Ellington composed new songs, put on many world tours and also scored the music for stage musicals and films. Many of his instrumental works have become Jazz standards that the average listener should be well aware of and familiar with many of Ellington’s compositions. His ability to be an entertainer as well as a performer helped elevate Jazz to a level where it was considered to be equal or even more influential than most other genres of music during the early 20th century. He was the first musician to really incorporate the idea of using a big band and/or orchestra to really propel jazz/swing as being distinct forms of music with their own style and substance. Ellington came from a modest upbringing in a middle class black neighborhood in Washington D.C. and was considered by others to charismatic, compassionate and a brilliant and dedicated musician. He is as well known for his ability to entertain people as he is for his excellent piano playing. Location played an important role in influencing Duke Ellington’s musical contributions to society. With each song he wrote and composed, he would try to tell a story about his community, his life and his race. It is no coincidence due to the Duke’s popularity and his wide following throughout America as one of the first prominent black musicians that he was often times referred to as a “race man.” People referred to him as this because of the cultural and social impact that he had as a popular musician representing the African-American community at a time when there were few black performers and entertainers in music. This was particularly due at the time to Jim Crow laws and general intolerance, racism towards the African-American community in many parts of the United States. 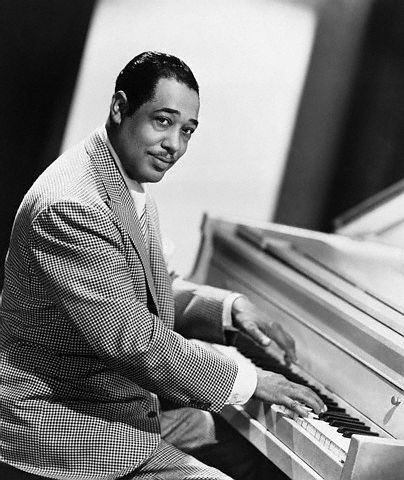 Duke Ellington in a way broke through the color barrier along with Louis Armstrong because of those who came before them when it came to music in America during the early 1900’s. Ellington was an instrumental musician in bringing Jazz music outside of New Orleans to towns and cities across the country especially in New York City when he hit the big time and made his home starting in 1927, at the famous “Cotton Club” in Harlem. From that and other clubs, his big band/orchestra set the bar high when it came to playing brilliant jazz, swing, classical and other forms of music. Over the course of his career, He made jazz and swing music into American music as he traveled around the world for thousands of performances in Europe, the Middle East, Africa and Asia. There is no doubt to the average learner and student of Jazz that Duke Ellington is one of it’s most important figures in its’ history. He was the genre’s most important composer, one of its’ most highly regarded performers and band leaders who employed many talented black and white musicians believing that everyone should have the chance to play regardless of the color of their skin. Ellington’s compositions are studied and played over and over by many musicians today and his prowess at the piano is often overlooked but was also instrumental in talking about his legacy as a musician. It’s fair to say that there will only ever be one “The Duke” and those who follow his lead. His work is also very important in describing American culture and music. His legacy is still vibrant today as many young people continue to pursue the arts and perform in music groups. They strive to play jazz and other types of music because of men like the Duke himself. 1.) 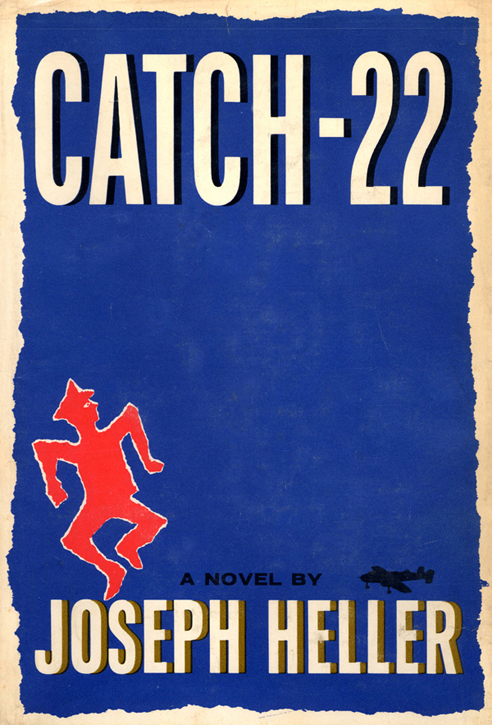 Catch 22 by Joseph Heller is my favorite book of all-time and has been ever since I read it at the young age of 16. This was the first novel that I had read which was satirical in content and utilized the concept the dark humor, which made it an enjoyable and fun read. Main characters such as Yossarian, Orr, Chaplain, Nately, Snowden, etc. were all really well-developed so you know who they were and their individual backgrounds before the end of the novel. It did help that for the first part of the book, each of the first eleven chapters were told from a different character’s perspective rather than focusing on Capt. John Yossarian for every chapter. Describing the events from different points of view through the third-person in a non-chronological order really made it unique in a way. This made Catch-22 an easier read as this kind of format gave me as the reader the chance to put the different events together into a singular plotline rather than spell it all out for me as other non-fiction novels usually do. This novel also introduced to me several important themes that I have thought about or come into conflict with in my own life. Examples of some of these themes being: Absurdity, ridiculousness of bureaucracy, questioning one’s religious faith, and the power, influence of greed and capitalism over others. 2.) 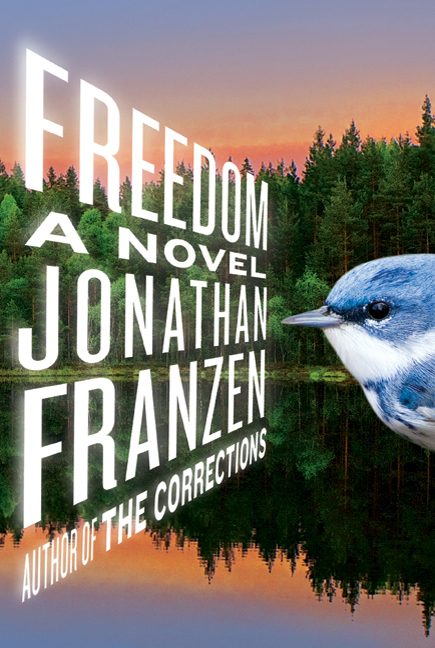 Freedom by Jonathan Franzen is another favorite and an excellent fiction novel focusing on an American family, the Berglund’s, and the complex relationships that they have with each other, their friends, and their lovers. Their story takes place over the course of one generation from the late 1970’s up until the beginning year of the Obama administration, in 2009. Each family member is well represented in Franzen’s novel with the narrative flow going from Walter (the father) to Patty (the mother), and then on to the children of Joey and Jessica. Franzen also develops his supporting characters to be an integral part of the story such as Richard Katz, Lalitha, Connie, and Jenna who all play a role in the unfolding of the novel. Freedom also successfully goes back and forth from first-person to third-person narrative quite easily and without any major hiccups. One of my favorite things about this novel is that incorporates into the plot the major events in American history and society that have happened over the past generation. Examples of these events in the book include the burgeoning environmentalist movement, 9/11, the Iraq war, and the rise of social media. I believe Franzen does a great job of bringing out the peculiarities and absurdities that encompasses American suburban life and he really shows you how the family changes over the years due to these outside events but also the changing relationships that mark these people’s lives. A fascinating novel overall, I highly recommend it. 3.) 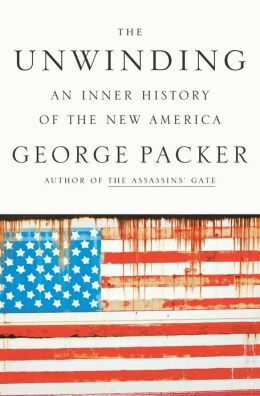 The Unwinding: An Inner History of the New America by George Packer is my favorite non-fiction novel and a book that should be read by any American who wants to understand the current state of our society, culture and our politics. Packer is an excellent reporter for The New Yorker who previously wrote a book about the struggles of the U.S. endeavor in Iraq in The Assassin’s Gate. Packer got the inspiration for writing this novel after he comes home from Iraq and witnesses the 2008 financial crisis and the collapse of the markets. Along with the auto industry, Fannie Mae and Freddie Mac, he realizes that the major institutions that have held America together with a sense of unity were falling all around him. The author does an excellent job of focusing on three ordinary Americans and detailing their personal history from the beginning of ‘The Unwinding’ in the late 1970’s up until the 2012 election. These three people are Dean Price, a struggling tobacco farmer in North Carolina who wants to revitalize the farmland by providing biofuel to school buses; Tammy Thomas, a black woman from Youngstown, Ohio who becomes a community organizer after losing her job multiple times from the closure of the factory plants along this rust belt city; and Jeff Connaughton, who comes to Washington as a staffer for Senator Joe Biden but becomes disillusioned by the lobbying, big finance levers that are pulling the strings of our politicians and leaders. One of my favorite things about this book is that Packer contrasts these three ordinary Americans with the giants of American pop culture, politics, music, and society by giving brief chapters devoted to the success of individuals of Oprah, Peter Thiel, Sam Walton, Jay-Z, Newt Gingrich, Alice Waters, etc. A must read in my opinion. 4.) 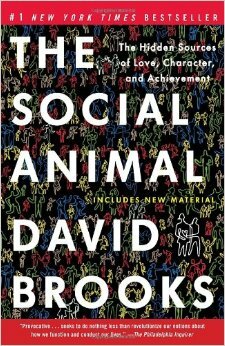 The Social Animal by David Brooks is another great non-fiction novel that I have read and re-read over the past couple of years. Out of all the books on this list, it has probably influenced me the most as a person. I usually disagree with Brooks’ op-ed columns in The New York Times due to his conservative leanings but when it comes to sociology, human psychology and understanding the sub-conscious, Brooks has done the research and it really shows through in this book. The most fascinating aspect of this book is how he sets it up as a fictional novel with a male and a female character named Harold and Erica respectively. Mr. Brooks uses a lot of recent research and findings to assert conclusions and summaries while charting an imaginary course for these two characters’ lives from Birth/Early Life to Death. My favorite chapter of the book and an area that relates to me personally is when Brooks describes the recent phenomenon of ‘The Odyssey Years’ or a person’s twenties where they are deciding what to do with career, marriage, and whether or not to have children. Brooks contrasts the ‘On The Road’ vs. ‘It’s A Wonderful Life’ type of lifestyles that young people often choose between as they come out of the Odyssey years. He details the differences of how to live such as ‘Single v. Married’ and decides its better for a person to establish roots in a community rather than going from place to place indefinitely. He makes a compelling argument using recent research for explaining what molds us into who we become in each major stage of our lives. 5.) 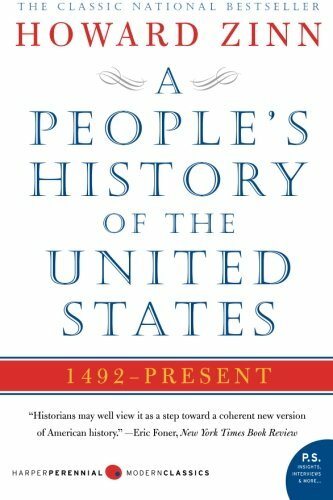 A People’s History of the United States by Howard Zinn should be mandatory reading for any high school student in America who’s enrolled in a U.S. history class. Unfortunately, it wasn’t required reading for me in my Advanced Placement course which was a shame. Luckily, I was able to read it during my senior year of high school when a family member recommended the book to me and left me with a copy. The lasting appeal of Zinn’s novel is that unlike many other history books, it deals with the lives of ordinary Americans struggling through the different, tumultuous periods of our short history and the author does an excellent job of relying upon interviews, data, and statistics to give their side of the story. Learning about the struggles of the Native Americans, the Women’s Rights movement, Civil Rights movement and other marginalized Socialists and Labor Rights activists like Eugene V. Debs was illuminating for millions of readers and myself. If only more politicians and the elite would read Zinn’s words, perhaps we as Americans would learn not to repeat the mistakes of the past and truly realize the notion of “Equality for all.” Lastly, one chapter of A People’s History that I continue to believe is very prescient even today is titled, “The Coming Revolt of The Guards” where Zinn hints at the discontent of American society even back in the early 2000’s due to the collapse of organized labor, growing wealth inequality, and the marginalization of the poor. Even though it’s a non-fiction book rooted in the past, Mr. Zinn had a lot of words of warning for our collective future. The days are getting shorter and the nights are getting longer. There’s a chill in the air and the leaves are falling. This can only mean one thing to what’s on the horizon again: Winter. It’s not my favorite season of the year. In fact, it’s probably my least favorite season. However, this doesn’t mean that I don’t like the snow or the fact that it gets cold for a couple of months. I know for a lot of you out there reading this that it’s probably your favorite season and I can understand that point of view. I just can’t agree with you though. I think that it’s the most boring of the four seasons and that there really isn’t much to do. I would like to think that I’m not the only one who goes into hibernation for a few months around this time of year. I’m mostly indoors and catching up on movies, television, reading good books, other indoor activities, etc. that I neglected when it was sunny and warm outdoors. It doesn’t help that there’s basically only seven or eight hours of sunlight as opposed to the twelve to fourteen hours of sunlight during the spring and summer. Growing up in an area located relatively close to the beach and the ocean, I couldn’t help but fall into disfavor with the winter season. I love the cool breeze, the seafood, the waves splashing and the warm sand. It doesn’t help my seasonal bias with the fact that I have never went skiing or snowboarding in my life which is a shame within itself. Perhaps, trying out some winter sports would change my opinion on this great debate. I’ll never understand those people who would rather be brutally cold than oppressively hot. I’ve always chosen being apart of the latter unfortunate situation. If it’s really warm, I can just go to the local pool or make myself a cold drink but if it’s really cold, I usually have less of a desire to be outdoors and remain inside, which can make me go stir crazy at times. I also really enjoy having more hours of sunlight to enjoy and I don’t think I’m alone in this. I have never really gotten used to the fact that during the month of January especially, it can become completely dark out by 5 PM. Surprisingly, the changing seasons can even affect a person’s mood and emotional state. Seasonal Affective Disorder (SAD) is a real medical diagnosis these days and usually occurs during the bleak, colder, darker months of the year, *cough* winter! *cough. * When have you ever heard of someone having the blues or being down in the dumps as a direct result of it being the spring or the summer? “SAD” doesn’t really happen at all during these seasons especially if the ice cream man comes around the neighborhood looking to handing out treats to the locals. Now, don’t get me wrong. 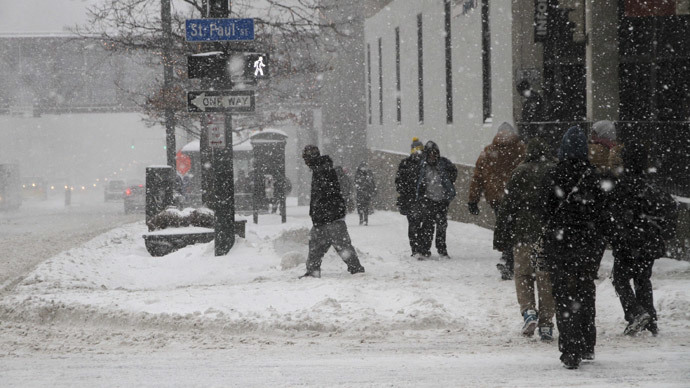 I don’t hate winter and I have some fond memories from my past of snowball fights, snow angels and hot chocolate after hours of playing in the snow. However, maybe it’s apart of childhood that we enjoy this particular season but now the tediousness of shoveling snow, experiencing flight delays, having cold/flu symptoms, etc. as an adult are complicating those previous happy memories from when I was younger. At least there are still the holidays (Thanksgiving, Christmas and the New Year); Winter will always have those advantages going for it in my mind. The online “blogosphere” and social media has significantly weakened news reporting and political discourse in the United States. There are many reasons for this phenomenon emerging and it does not seem to be getting any better soon as technology continues to develop and advance at a rapid pace. Today, the main problems are the fact that serious journalists and reporters care more about ‘breaking the story’ first on platforms such as Twitter and Facebook before other competing news outlets instead of getting the story correct along with all of the facts. In addition, there are many ‘talking heads’ and bloggers’ out there reporting and analyzing the news so that it makes it even more difficult than ever to know which person to listen to and who actually has the expertise and background knowledge to be really reporting the news without any inherent bias or slanted opinions. Lastly, since the early 2000’s, many news networks and websites have emerged with the support of major corporations whom have been created with the sole purpose of advocating for the ‘liberal’ or conservative’ side of any political or social issue. These three problems have caused the political conversation in the United States to become more and more divided. The two major political parties continue to be highly partisan and refuse to work with each other to improve the functioning of the U.S. government and its ability to help and aid its citizens. There have been many instances in the past five to ten years where news reporters on social media have made ilogicial conclusions and given their audience false facts and assumptions based on the information they were getting when a news story first breaks. For example, the terrible Boston Marathon bombings that occurred a few years ago were first fraught with a lot of inaccuracies and falsehoods when the news reports would come in just after the terrorist attack has occurred. Most recently, during the early moments of the tragic mass shooting that happened in Roseburg, Oregon, numerous media outlets scrambled immediately to report the correct amount of dead and/or injured people on social media. Many of the news outlets reported false numbers at first because they refused to wait for local law enforcement officials to give them the official numbers. If you follow news organizations on social media, you often have to take the initial reporting of a major news event or crisis with a huge grain of salt. Initial reports from different news outlets can be false or exaggerated. Many different news outlets rushed to Twitter, Facebook, and elsewhere on social media to be the first with the details of this terrible event but instead of verifying and fact-checking these breaking events and waiting to be sure that they were right about the news, many online websites would publish the information they received as quickly as possible in order to have the distinction of being the ‘first’ to report the news even if it wasn’t true. More than ever, major news networks are relying on ‘talking heads’ and ‘political commentators’ to talk about heated issues in the American political sphere instead of putting reporters and journalists on the ground to gather facts and report about the big issues. Instead, many news networks, newspapers, and websites have grown their opinion (op-ed) article section and have taken money and resources away from those reporters and journalists who would like to report the news instead of just ‘interpreting’ and ‘analyzing’ it to death. The proliferation of ‘bloggers’ and ‘social media commentators’ has distracted the average American from getting the main facts of a news story. It has caused most citizens to be unable to tell the difference between an actual journalist who does his or her research and checks the facts of the story and those bloggers who don’t actually report the news that happens. It is growing trend among mass media outlets to slant it to their own viewpoint and that of their audience without taking into account the actual story and the idea that there may be more than one side to a news issue or topic. 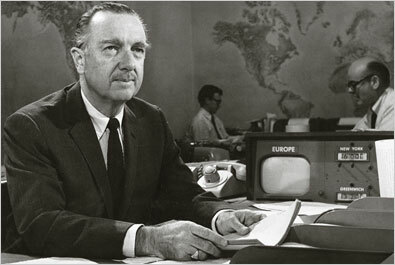 I fear that some of the mainstays of good journalism such as thorough fact-checking, and fair and honest reporting from the mass media will continue to decline in the future due to the rise of social media. Disclaimer: These views and/or opinions are inherently mine alone and do not reflect those of any other unaffiliated outside party, organization, and/or company.